On a recent trip to Japan, Recyclist project manager Emily Blackmer took some time to explore a whole new side of travel: trash tourism. Since working at Recyclist, I’ve come to see garbage in a new light. This was particularly apparent on a recent trip to Japan, where I found myself inspired to photograph public trash cans, curbside recycling, and a municipal recycling guide hanging on a guesthouse wall. With a background in anthropology, I also appreciate that waste is a cultural phenomenon: what we dispose of and how we do so can serve as a window into what we value, both materially and otherwise. In that spirit, here’s some of what I’ve learned about Japanese trash and the country that produces it. 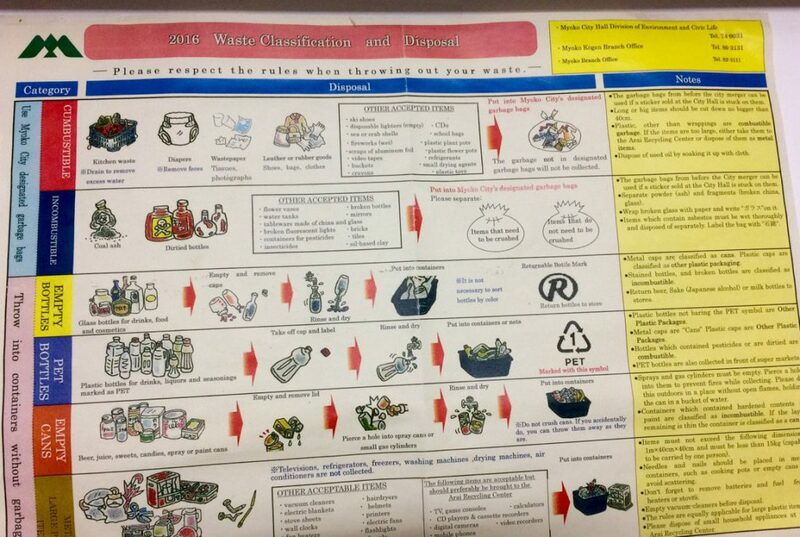 Japanese residents must sort all their waste into as many as 10 (or more) different categories. Let’s just say that single stream is not a thing. In a country where rules are made to be followed, erring in your sorting, using the wrong bags and other recycling wrongdoings risk the ire of your neighbors or a reprimand from authorities. To make things more difficult, waste regulations vary greatly from one place to another; how you sort in one place may be completely different from how you sort in another. Perhaps unsurprisingly, how to navigate Japan’s waste disposal system has become the subject of numerous blog posts for foreigners and articles by disgruntled expats. 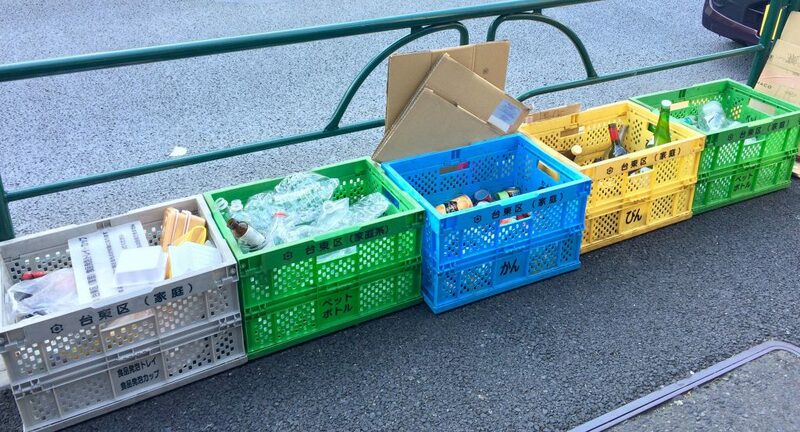 Recycling out for collection in a residential Tokyo district. Between all this sorting and the high degree of local variability, recycling guides — called Gomi guides — are essential. Long and packed with detail, these documents function as comprehensive waste disposal guides — much like Recyclist’s Ultimate Recycling Guide. I came across a print example of a Gomi guide on the walls of a guesthouse, and have since found digital copies from other towns. (Here are two PDFs from Nagaizumi and Kutchan.) The print version, from the small mountain town of Myoko-kogen, meets most of Recyclist’s standards for good communication: logically organized with scannable headlines, clear images and actionable text. More impressive may be the fact that multiple towns are publishing their Gomi guides in English (not a fluent language for most locals). Making information accessible to a broader range of people is always going to improve results. A page from Myoko-kogen’s Gomi guide. So why does Japan take proper waste disposal so seriously? Much of the answer goes back to the age-old clash of geography and population. Japan is a relatively small and mountainous island nation; it ranks 62nd among countries in terms of land area, and over 70 percent of its territory is covered in mountains. Meanwhile, its population ranks 11th in the world. At odds with one another, these realities means that usable land is in short supply. If space is scarce, most people agree that landfills are a terrible way to use what you have. Recognizing the shortage, in the 1990s Japan developed its current comprehensive recycling programs. Japanese waste management also relies heavily on waste-to-energy (WTE), the sometimes-controversial practice of burning garbage to generate power and reduce landfill use. While Japan is not the only country to use WTE extensively, it is certainly a leader in the practice: 2011 estimates located 70 percent of the world’s WTE plants in Japan, burning about 75 percent of the country’s waste. So what am I taking away from this newfound knowledge? To be honest, I’m struck that Japanese recycling is so, well, Japanese. This isn’t as simplistic as it sounds — what I mean is that waste management is a culturally rooted phenomenon. In Japan, I saw this in the adherence to rules and regulation, the forward-thinking tech solutions, and the inescapable reality of living on mountain-covered islands. Across the world, the choice to toss, recycle or keep is steeped in social norms, communal values and often even our ties to a given geography. This presents us with an opportunity: recycling programs and outreach efforts can maximize success through a focus on local values and practices.